I whipped up this comic last night for #BellLetsTalk day today. If you don’t know, that is the day that Bell gives 5 cents for every tweet with “#BellLetsTalk” in it, as well every text and long distance call made on their network, to mental health initiatives. It’s a day to talk about the importance of good mental health, to end the stigma, and to force a giant corporation to give money to a good cause. I’m pretty open about my OCD. I don’t think it’s a big secret that I’ve been dealing with it for more than a decade. 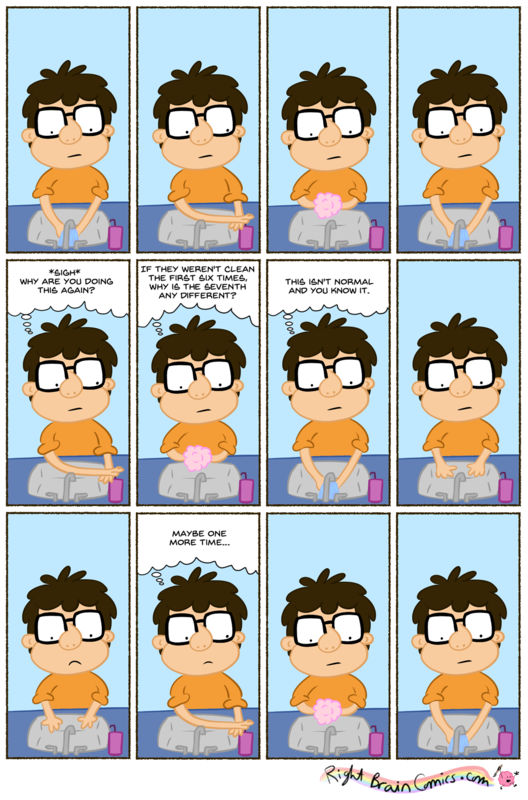 This comic depicts what it was like before I got help. I’m glad I did, or else this comic would never be updated because I’d still be washing my hands for the 50th time to make them clean enough to use my precious computer. (I wish I was exaggerating, but I once actually did wash my hands 50 times back-to-back. For what, I don’t remember. But you can bet it was a stupid reason.) I’m better now, and have been for years (it has nothing to do with no comics since 2011). I still probably wash my hands more than a “normal” person (if such a person exists), and I still won’t touch most door knobs, but, in general, I’m fine now. Anyway, if you’ve been suffering in silence from any sort of mental health issue, whether it’s OCD, depression, anxiety, or whatever, talk to someone – a doctor is a good place to start. Life’s too short.